The processes of human civilization are changing the planet into something quite inhospitable. Evidence of the transformation can be seen everywhere, but there's one prominent example in the North Pacific Ocean. It stretches across 270,000 square miles (exceeding the size of Texas) and is calculated to weigh in at 100,000,000 tons. If the work of numerous devoted oceanographers and engineers is unsuccessful, then it promises to become of the first continent of a new world we unknowingly built. It's a loosely organized island of garbage, undulating in the waves. They call it the Pacific Trash Vortex. Like so many environmental problems, the Trash Vortex didn't arrive without warning. 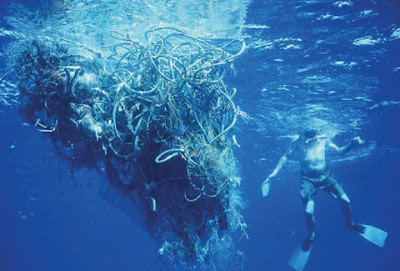 In 1988, the National Oceanic and Atmospheric Administration examined the convergence of several ocean currents and predicted that plastic debris from America, Canada, and Japan (along with discarded fishing nets and the nautical liter produced by international shipping) would begin to accumulate in specific areas. Nothing was done and the bigger-than-Texas problem is the result. First observed in 1997, the Trash Vortex is only one of several, with others floating in the North Atlantic and Indian Ocean. The masses of plastic are weathered by the surf and sun, but do not biograde. Some of the innermost garbage has been there for decades. Marine life and sea-birds become entangled in the Vortex and often die trapped or suffocated. Some are even poisoned after swallowing bottle-caps and bits of ballpoint pens. Still worse, toxins produced by the garbage patch (like those old classic PCBs and DDT) seep down into the ocean to harm those creatures beneath the waves. Currently a handful of nonprofits groups and research organizations periodically head into the Trash Vortex to perform tests and raise awareness. But its has yet to be contained. As of now, the Vortex grows ever larger. For god's sake, recycle, okay? Yeah! And reduce and reuse, okay? And hey! Wait a sec! Mr. Monday! When can I collect my spiral-cut ham, eh? yeeees, yeeees, my evil plan is wor- Oh! hey, didn't see you there! Well, once the continent of plastic gets big enough, we just send a big hip out there to harvest it. Rising oil prices make it profitable to recycle scrap plastic. Stop the madness! Stop this obsession! THERE ARE SOME PROBLEMS IN LIFE THAT BIG HIPS CAN'T SOLVE! Hey! Thanks for the comment. It really enhances the discourse to have such knowledgeable people swing by to the Kitchen and speak their mind. I completely agree with your assessment of the situation. I probably am a little fucktarded...and I can't believe I overlooked the solution that you suggested. Yes, big hips are clearly the answer. We just send out those hips to the Vortex and harvest it up. However, as you say, we should wait until it gets big enough. I mean, right now it's only larger than the entire state of Texas. Small potatoes. If we really want to make a profit, we need to wait until the whole ocean is covered with that sweet, sweet money-making plastic. Simple, efficient, inexpensive...a brilliant plan. Yessir. It's as easy as holding up your own hammock. I imagine that your job at the Burger King keeps you busy, but promise me you'll capitalize on your innovative thinking. God speed. Born and raised in the glow-in-the-dark environment of Utopia City, Gordon Monday was trained by a trio of mysterious monks and sent back to the 21st century on a secret mission. 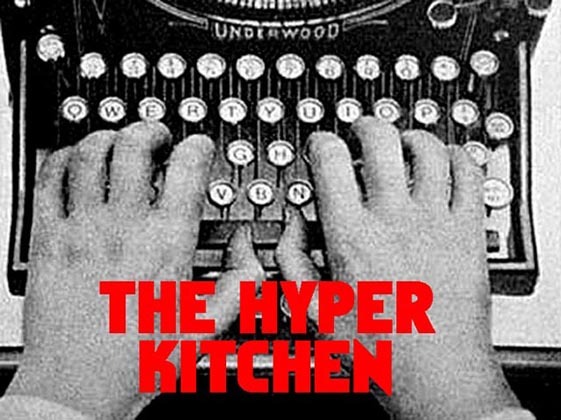 When not on the case, Monday is the executive chef at the Hyper Kitchen. His devotion to the Kitchen leaves him with little free time...although he does like to indulge in playing basketball and tending to his ant farm. Our prayers are with him! An Exclusive Tour of the Kitchen! These people are winners because they never quit. No free lunches. Don't swipe my articles. As exciting and majestic ideas are steadily reduced to factoid snacks and unsatisfying pablum by the supermedia grinders at work, the chefs of the Hyper Kitchen shall endeavor to cook up strange stuff and bring attention to figures who linger in obscurity. The trivial will be essential! 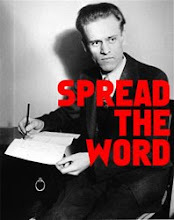 The profane will be profound! It's the dawning of a delicious new era.